Nothing keeps you prepared for the summer like the beach, water and a beach ball. If you think every beach bag should have at least one beach ball with other beach accessories, you should order these custom two color beach balls right away! Kids and their families will use them at the beach, in the garden, in the yard or even at packed halls. It means your brand logo is set to enjoy wide exposure over these beach balls. 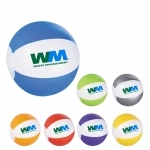 We guarantee that you can get you these high-quality beach balls customized with your brand logo at the lowest possible price. We will give you 100% free artwork assistance and free e-sample of your brand logo. We offer fast shipping with the contiguous USA. 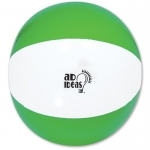 Let good times and goodwill roll over your brand with these beach balls that are printed with your brand logo or brand graphics. 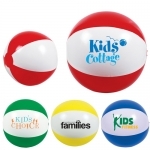 Logo two color beach balls are perfect promotional giveaways for kids because these can easily trigger interest in your brand. 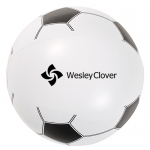 Today, many businesses are keenly investing in beach balls printed with their logo because they know it brings fun and versatility. They understand that not only kids, even their parents and other adult friends will easily like these beach balls. Most people love to receive promotional gifts that will offer them some relaxation and fun without demanding extra efforts. 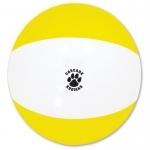 These customized two color beach balls easily fit the bill. 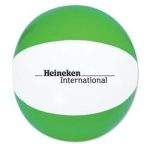 If you want to boost your promotion and want to derive maximum exposure for your brand logo, check these custom printed beach balls with two color panels. 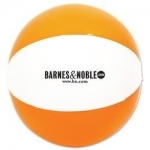 Our phthalate free beach balls can be customized in any manner you want. 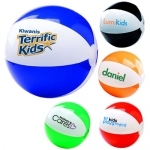 We are sure that your young customers will appreciate these beach balls at the same time the parents will take note of your brand name and logo imprinted on it. 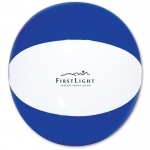 If you are on a look out for the ideal promotional item that will offer prolong exposure for your brand logo, you should invest in these personalized two color beach balls. 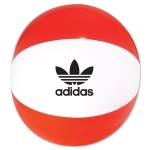 We also offer a great selection of customized one color beach balls and personalized multi-color beach balls to meet your requirements. Do you know what makes these custom printed two color beach balls stand out from their colorful design? Its large imprint area. 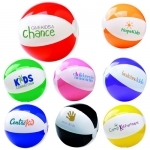 You can leave your brand logo, message or quote over these beach balls so that your recipients, their parents and all other potential customers can take note of it. For any additional information about these custom dual color beach balls or other types of custom beach balls, feel free to get in touch with our product experts team at 855-454-3786 or email us at info@promo4kids.com. To know more about the order process, click here!